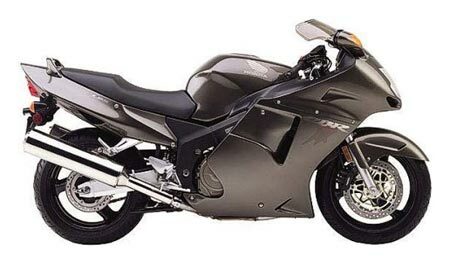 The sophisticated CBR1100XX rewards the mature big-bore sport bike rider with immense power, impeccable handling and Honda’s unparalleled fit and finish. · Electronic CPU provides two digital 3-D fuel injection maps for each cylinder and one digital 3-D ignition map for cylinder pairs, creating ideal fuel mixture and spark advance settings for superb response. · Large-capacity aluminum radiator combines with high-efficiency oil cooler mounted directly beneath the steering head to help maintain optimum performance and long engine life. · The fairing has been designed to reduce the number of panels. Gas-assist injection technology is used to increase strength and lower weight. · LED fuel gauge in instrument panel. · Ownership includes one-year complimentary Membership in the Honda Rider’s Club of America. Benefits include discounts, travel benefits, roadside assistance and much more. For HRCA details, call 1-800-847-HRCA. Dual 310mm floating discs with three piston calipers, LBS. Single 256mm disc with LBS triple piston caliper.